As we walk along the road of life, we some times reach for crutches to help us along the way. Mine was opiates that started after an injury and ten years later I end up at the Methadone Clinic. They talk a good game but turned out all they want is your money. I spent five years on methadone as was up to 135 milligrams a day. I had to be available upon 24 hour notice for drug testing. That puts an end to a short weekend get a way with the family. Though I lived close to the clinic, some traveled 60 plus miles everyday, until they were allowed two carry outs a week. Then after another year you could come once a week. Being in my mid fifties, I could not picture myself driving up to the clinic, with cane in hand to get my daily fix. I tried going down on my dose but went into withdraw. I begin to search for an end to this madness, as it was like a ball and chain. Then by pure luck while on the internet, I came across the Rapid Drug Detox site. I had looked at other sites but with a cost a little much out of pocket expense. So I picked up the phone and talked with Jeanne, as I had a lot of questions concerning the procedure. After a lengthy conversation I was starting to get a comfort level, but was not there yet. Jeanne suggested that I call some previous clients that had the procedure and talk with them concerning their experience. I talked with a client that had his clean day in January and another who had only been back a few weeks. 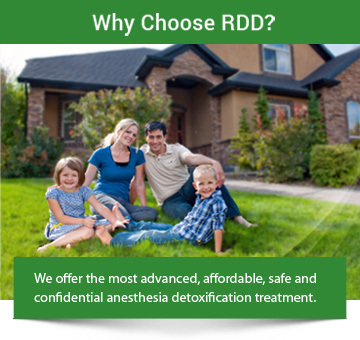 Both individuals could not complement the staff at Rapid Drug Detox Center enough. They said they really care about your well being, not only while you are there but after you get back home. People that really care about me being a functioning Methadone Addict and wanting to help me ride myself of this addiction. Sounds too good to be true but I am here to tell you that they do care and even call you up after you have been home to check up on you. Well that did it, I called Jeanne the next day and set up my clean date. Now everyone that is addicted to opiates, methadone, heroin, etc. knows about the pain associated with withdraw, as they are just about unbearable for the average person. So here is the real scope of my experience with the procedure. I arrived at the center on Tuesday at noon and filled out paper work and questioners. Then I meet with the doctor, who I consider a real professional. I also meet with a psychiatrist and had blood work done. Now being in my fifties, I had to have a stress test the next morning prior to the procedure. They put you in the OR and get you hooked up to the IV bags and then start the procedure, all the time assuring you that everything will turn out just fine. Then I was sitting up and walking back and forth to the restroom. They gave me medicine to help with any discomfort that I had. My biggest discomfort was the aching in my legs. I had NO cravings at all and still don’t after over a month. I was very fatigued the next week after getting home after two days after the procedure and found that I could not put a full day of work in. Jeanne said that I would be fatigued for a week or so and that everyday you get stronger. She could not have said that any better as that is just how it was. I still had leg cramps but they prescribed medication to relieve this and now the cramps or pain in my leg bones are getting less day by day. Many thanks to the staff for saving my life! I can not put into words what that really means. Thanks for all the care and calls as that meant so much. If you want to be rid of your addiction to opiates this is the place to have it done. Again I thank you from the bottom of my heart for what you did for me and others like me.